I'm trying to check the "fiberEquipment" table against the "material_cd" table and find instances where there are discrepancies. 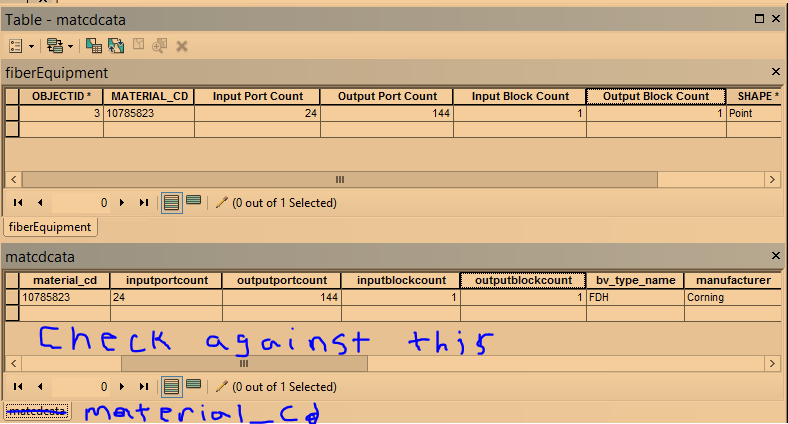 E.G -- Checking that "material_cd" 10785823 in "fiberEquipment" has all the correct values associated with it (inputportcount, outputportcount, inputblockcount, etc.) per the "material_cd" table. The code I'm using below takes the values from the "fiberEquipment" table, inserts them into a dictionary and than uses a search cursor invoking the dictionary elements to check for discrepancies. The code currently works without any errors, but the logic seems to be flawed, as it's not doing anything when all fields match. This is essentially asking if 10785823 = 24 which obviously it does not! Not the answer you're looking for? Browse other questions tagged arcpy cursor dictionary or ask your own question. Comparison between two fields of two tables using ArcPy cursors?